Readers write in about travel along the Connecticut River, an A+ blind date, and more. “Journey to the Sea” (Fall Travel Issue, September 16) was well written and researched. 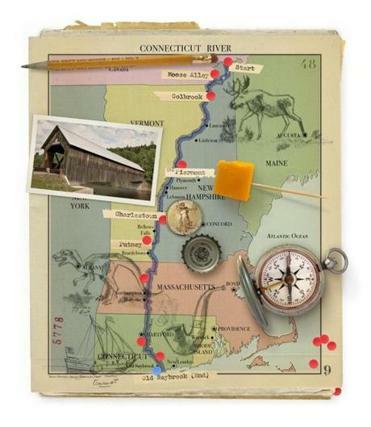 The nicely illustrated map follows the Connecticut River from its Pittsburg, New Hampshire, origin at the Canada border to its Old Saybrook, Connecticut, exit to Long Island Sound. Some wonderful small communities and references to food and lodging along the way. I’ll likely never visit exotic Marrakech (“The Road to Marrakech,” September 16), or live in one of the grand, million-dollar estates often featured in your magazine, but I’ll save this issue for a future journey along this somewhat overlooked New England Connecticut River route. I’ve been married 30 years [and] using my own name (Miss Conduct, September 16). I sometimes receive cards addressed to “Mrs. (his last name)” but usually from folks who don’t really know us. My husband frequently orders takeout, etc., using my last name because it’s easier. No one is offended either way. This is a pretty small problem. I’ve gotten family Christmas cards addressed to the “(husband’s last name) family,” and I don’t make a fuss over it. Typically it’s from some of the older relatives from my husband’s family. Big deal. They were nice to send a card! Life goes on. [The letter writer] should let [her] daughter deal with it when she writes her thank you notes for her wedding gifts, it’s not really your issue to solve, mom. I am a grandma and I aim to be just like [author Rebecca Beyer’s grandmother] (Connections, September 16)! Thanks to her for sharing this story and providing a great role model for grandparents everywhere! Oh my gosh. I actually said “Yay” out loud after reading about the date. Sometimes, a blind date can really click and it reads like this one really did. Love the mutual A pluses. This may be the first date on Cupid that I think could lead to wedding bells (Dinner with Cupid, September 23). How refreshing that a millennial date would include topics like world affairs, books, and an upcoming visit to a museum. There’s hope for society after all. This made me so happy to read. I am rooting for them to have success with their relationship. Two lovely people who care about the world. Now what’s better than that? I am generally pleased with Michael Blanding’s article, “Free Radicals,” about unschooling centers in the Boston area, published in Globe Magazine’s Education Issue (October 7). However, I am writing to correct a misimpression, conveyed to me by a number of readers. In the caption under my photo and elsewhere in the article are statements implying that I believe reading, basic math, and computers should be required of students and other subjects should be optional. In fact, a basic principle of Self-Directed Education is that all learning should be self-chosen and self-directed. In our culture, children will learn to read, calculate, and use computers because they are immersed in a literate, numerate, and digital society. CONTACT US: Write to magazine@globe.com or The Globe Magazine/Comments, 1 Exchange Place, Suite 201, Boston, MA 02109-2132. Comments are subject to editing.